Wall discusses the balcony scene in Romeo and Juliet, the emotional life of the characters, and applying the narrative dynamics of the play to the ballet. David Wall was born in 1946 and trained at the Royal Ballet School. He toured with the Royal Ballet under the direction of John Field. Wall's first major leading role was in Ashton's Two Pigeons, which he danced with his future wife, Alfreda Thorogood. He later danced the roles of Siegfried and Colas and received acclaim for his role in de Valois' The Rake's Progress. He retired in 1984 and became Associate Director of the Royal Academy of Dancing (1984-87) and then director (1987-91). In 1995 he became ballet master with the English National Ballet. 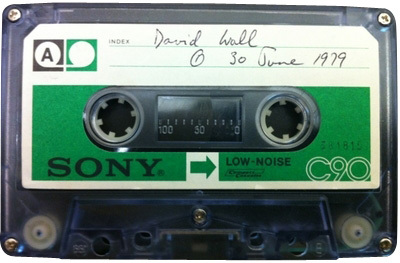 June 30, 1979, Wolf Trap Theatre, Washington, D.C.
October 10, 1979, Royal Ballet School, London, U.K.
“David Wall (published 1982),” Dance Dialogues: Interviews by Barbara Newman, 1979-Present, accessed April 25, 2019, http://dancedialogues.prattsils.org/items/show/35.